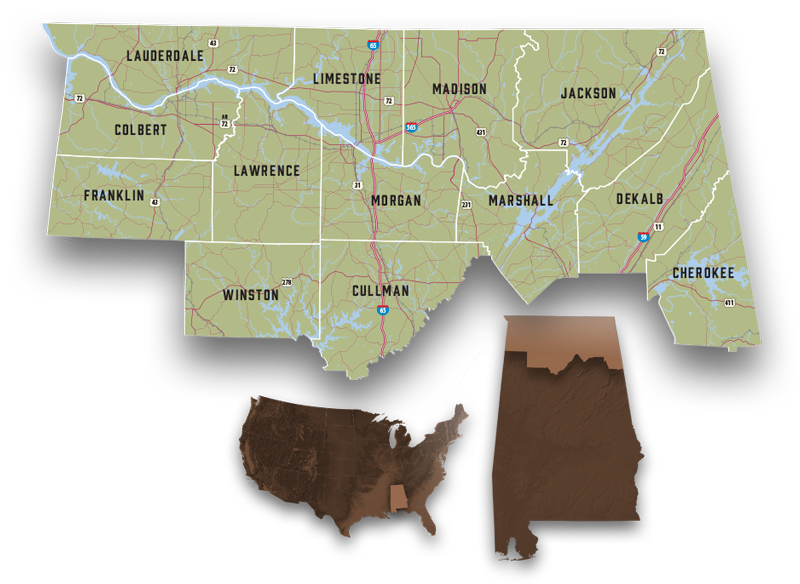 The North Alabama Industrial Development Association represents 13 counties in northern Alabama. Our 13 county region has a population of 1,132,106 (2016) with a median household income of $42,675 (2016). The mean drive time to work within the region is only 25.15 minutes. North Alabama has more than 90 available industrial buildings ranging in size from 5,000 sq. ft. to over 550,000 sq. ft. Five of these are spec buildings. North Alabama also has more than 140 industrial sites that are 10 to 2,000 acres. These include 14 AdvantageSites ranging from 26.5 to 752 acres and included the 1,252 acre TVA MegaSite that was recently selected for the new Mazda Toyota (MTMUS) joint venture. Visit automotivesites.us to get quick access to select available sites and buildings suitable for suppliers and other companies seeking a North Alabama location. Each county in North Alabama offers unique opportunities for industry and has been primed to support new and expanding companies. To learn more, visit our individual county pages. Want more information on North Alabama industrial development?